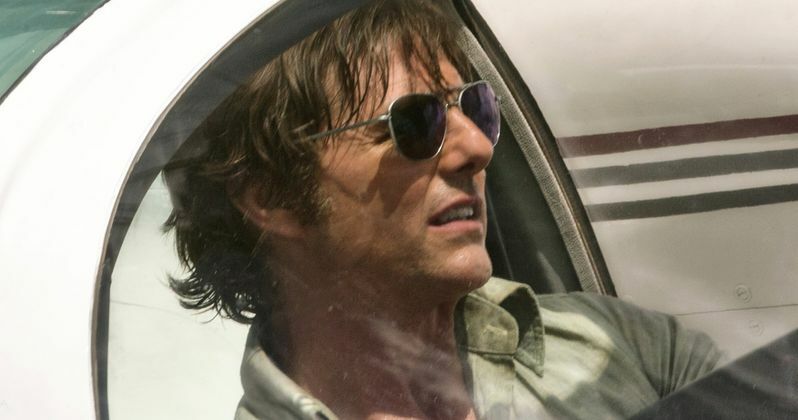 When the first American Made trailer debuted last month, it featured a number of scenes with Tom Cruise's character Barry Seal piloting a small aircraft, which he used to smuggle drugs in and out of the country. Today we have word from director Doug Liman that it was actually Tom Cruise in the cockpit for those scenes, flying the plane himself, while performing a number of other tasks that made this stunt even more dangerous than it looks. Here's what director Doug Liman had to say about this insane plane stunt in American Made. "Flying extremely fast, small airplanes, low to the ground, is a dangerous environment to be in just on its own. Then, in the story, he's throwing bales of cocaine out of the airplane, loading them up with guns, so every once in a while in this scene he's got to climb out of the cockpit and go to the back of the airplane to dump the cocaine out. I'm flying alongside him in a helicopter filming, and that made a big impression on me, there's nobody in the cockpit of the plane! Tom has gone to the back of the aircraft, and he's alone in that airplane. It's one thing to have Tom Cruise alone in the airplane flying it, that's already outrageous, now he's alone and he's not even in the cockpit so he's gone beyond. It was already a stunt before he left the cockpit, it was already a serious stunt." "It's a comedic look at the 'War on Drugs' because at the same time the White House had a 'War on Drugs' they also had a 'War on Communism,' and the people willing to fight the communists were the drug lords, and so you had these two branches within Reagan's White House working at total cross-purposes. And you had Barry Seal taking advantage of both, and profiting from both. (My father) always saw the humour in the details of the story and would come home and tell the outrageous things that he had uncovered that day. It's the most incredible story, probably today with what's going with the world, it's pretty clear that some of the most outrageous things you can't really invent. The world can create things more outrageous than any screenwriter can imagine." The diverse supporting cast also includes Sarah Wright as Barry Seal's wife Lucy, Domhnall Gleeson as Barry's CIA handler Monty Schaffer, Caleb Landry Jones as Bubba and Jayma Mays as Dana Sibota, with Connor Trinneer portraying then-President George H.W. Bush's son, future U.S. President George W. Bush. While this is based on a true story, it isn't adapted from a book, with director Doug Liman and writer Gary Spinelli getting details from Barry Seal's second wife about he ex-husband, which helped flesh out the story. Hopefully we'll find out more about American Made soon as we get closer to the September 29 release date.